This story was written by Masada Siegel. Several things run through your mind at the end of a great adventure seeking beauty in the world, especially when you have quit your job, run out of money and aren't certain where in the world you are headed next. But a philosophical discussion on the meaning of life with a perfect stranger certainly is not one of them. Grant, a member of an elite Australian special forces team was in line behind me at the Sydney airport, when he started talking to me. It was August 2004 and I was returning home after three months of wandering around Australia and New Zealand. He was heading to Wales. "Everything happens for a reason," Grant's voice echoed in my head. "How can you be so sure?" I asked. "I know it. I've seen it every day of my life, and it's just how the world works," he said confidently. "How can you believe it?" I wondered. "How do know that things happen for a reason? Maybe things happen and we give them reason, and not the other way round." A million thoughts swirled in my head, especially September 11. I vividly remember the day, as I was working for CNN on the Lou Dobbs show, Moneyline, as a field producer. I had just started and was excited. Financial news was perfect for me - generally low drama. I distinctly remember a conversation with my father in late August 2001. I said, "I can do this. The markets go up and down, there is no blood and guts in these news stories." Weeks later, September 11 happened in front of my eyes. Even today, writing about it brings tears. 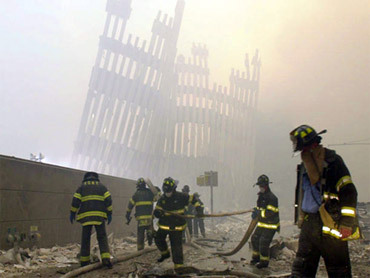 In disbelief, I watched smoke pour out of the enormous gash in one of the World Trade Center. Soon after, the building started to fall, as I watched, my brain was screaming, "There are people in that building and you are watching them die and there is nothing you can do." I have never felt such anguish and helplessness. "Where were you on September 11?" I asked. Grant explained, "I'll never forget September 11. My mother died in my arms at the hospital and then my brother and I heard the news." I couldn't help but think, as I was watching the world falling apart, his world was also falling to pieces thousands of miles away. Soon after, Grant was sent to fight the war in Afghanistan. I covered the story for two years and my usual sunny disposition disappeared. Covering funerals and sad stories daily took its toll. I needed a change, and wanted to focus on the good in the world. I read books by the Dalai Lama, and every positive person out there I could find. But the book that made the most sense to me was the Australia & New Zealand guidebook. So I did the math, dug into my savings account and booked myself a flight. In my quest to find a new perspective of life, I climbed glaciers, went white water rafting, hiked mountains, and scared myself to death by getting talked into skydiving in New Zealand with my new friend Dave Ellis. Dave and I bonded immediately after jumping out of a perfectly good airplane 12,000 feet above the earth in Queenstown, New Zealand. So when he invited me to spend time with him and his girlfriend in Perth, Australia, I accepted. I had no plans on this adventure, and wanted to see where the world would take me. One evening in Perth, we had dinner with Dave's warm and loving family. His British grandmother, Bette Ellis told me she had met her husband in Jerusalem in 1946. Leonard was in the British military, and they traveled the world together. She was an adventurous lady filled with energy, and as a youngster she was an avid dancer. Mesmerized, I listened. Her world was forever changed on Feb 28, 1967 when she was severely injured in a terrorist bomb attack in Aden, Yemen. The bomb exploded during a cocktail party. The two women talking to Bette were killed. Her injuries were severe, but she survived and was left paralyzed from the waist down. The incident shattered the Ellis family. Her youngest son, David, was sent to England to be looked after by Bette's sister. Her husband Leonard suffered from extreme guilt because he had left Bette at the party as he was called away to work. They eventually divorced, and she found herself a single parent to three children. Leonard went on to have three nervous breakdowns and died aged 62 from cancer. In my search for beauty in the world, I had come face to face with terrorism and seen the effects it had on a family 40 years later. Once again my heart was ripped to shreds over how one act, one moment in time, can shatter and splinter a person and a family forever. The story stuck with me, and I recently e-mailed Dave's father, Alex Ellis to interview him. He wrote, "Thanks for the interest in Mum's story. Yes, the impacts may go on for years and in many cases are difficult to cope with whereas the public interest tends to be more about the event and the immediate impacts. In many ways, there are almost forgotten victims of such attacks. Mum was a very strong person and led a very active life considering the extent of her injuries. Her story is certainly one of strength and hope but there is no doubt that many other victims have not fared as well." He continued, "Coincidentally, Mum passed away two years ago and the date is very easy for us to remember as it was 11 September 2008." Wiping away tears, I shook my head in disbelief, I can't help but wonder about the timing. So while nine years have passed since September 11, 2001, for many, it is as if it happened yesterday, and for even more people, the scars of terrorism will be there for generations. I don't know if I believe that things happen for a reason, but I do know that giving them reason is all most people can accomplish. Perhaps take a moment out of your day, remember the victims of terrorism and try to do something to try to make the world a better place.